Looking for the perfect Biltmore wine to pair with this recipe? We have just the selection. My wife’s specialty is salads. We have one with every lunch and dinner. This Arugula Salad was devine. Roast sweet potatoes in a 450°F oven for 45-60 minutes. Cut the potatoes in half and scoop out the flesh for later use. Cut your sweet potato skins into strips or wedges. Add enough oil to a saute pan so that it climbs about a third of an inch up the pan’s sides. Heat the oil over medium heat and brown the skins on both sides. Some parts of the skin will be browner than others. Drain the skins on paper towels and season them liberally with kosher salt. Meanwhile in a small sauce or saute pan simmer together the maple syrup, coriander seeds, vinegar and chili flakes till it reduces ever so slightly. 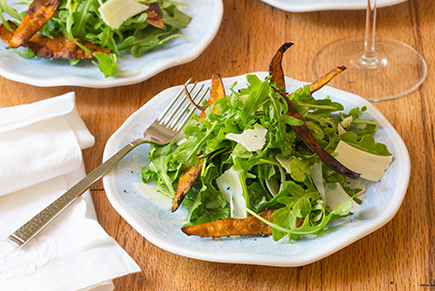 Toss your arugula, olive oil, lemon juice, salt and shaved cheese together in a bowl. Put it on a plate with as many skins as you like. Drizzle the whole thing with the maple reduction.